Georgina Chambers	travelled on the Australis with her parents and older brother on Voyage 51, northbound in November 1975. Georgina has many happy memories of that month she spent on the ship. They set sail from Melbourne all the way through to Southampton, stopping at several ports on the journey. 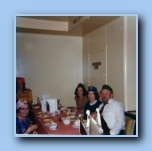 It was the second time her family had been on the Australis as they had sailed from Melbourne in 1967. The photos are of Georgina in a talent contest on the ship, a fancy dress competition, and the Crossing the line ceremony(The Equator). The photos above are courtesy of Georgina Chambers.